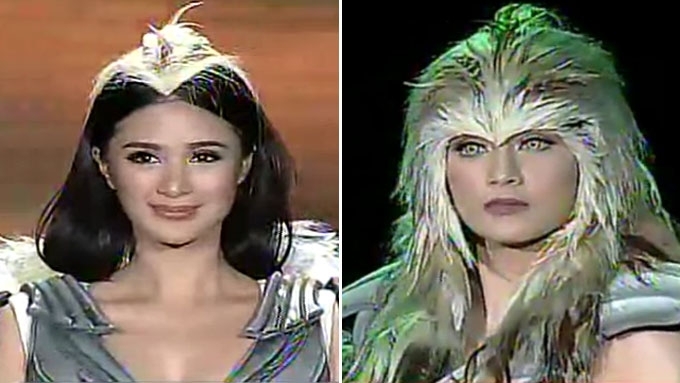 Heart Evangelista (left) will reprise the role of Angel Locsin as Alwina while Carla Abellana (right) will breathe life to Bianca King's former character Aviona in Mulawin vs. Ravena. Currently, Angel and Bianca are now both with ABS-CBN. The cast members of GMA-7's upcoming telefantasya Mulawin vs. Ravena have finally been revealed. A media announcement was held today, March 27, at GMA Network Studio 7. Heart Evangelista-Escudero will breathe life anew to Alwina, formerly played by Angel Locsin in the original Mulawin aired in 2004. Dennis Trillo, on the other hand, will reprise his role, the Ravena Gabriel who is now the king of Halcoria. Carla Abellana will reprise the role of Mulawin Aviona, a role formerly played by Bianca King, who like Angel is now with ABS-CBN. Miguel Tanfelix will also portray his former Mulawin role Pagaspas, which he first reprised in the requel of Encantadia. Bianca Umali is now set to play the grown-up Lawiswis, originally portrayed by former child star Sam Bumatay. Lovi Poe is Magindara, the daughter of Sandawa and is regarded as the goddess of water. TJ Trinidad is set to play the role of Greco. He was last seen in ABS-CBN's primetime teleserye A Love To Last. Derrick Monasterio is set to portray Almiro, the son of Alwina and Aguiluz. It may be recalled in the film version of Mulawin in 2005 that Alwina and Aguiluz bore a young child who was seen in the closing sequence of the movie. Bea Binene will play the role of Anya, the daughter of Aviona. Kiko Estrada will bring life to Rafael, Almiro's best friend who turns into his rival. Coincidentally, Kiko's father Gary Estrada was part of the original Mulawin wherein he played Rasmus, a Ravena. It is interesting to note that Angelu de Leon gets the chance to work with former love team partner Bobby Andrews and ex-boyfriend Joko Diaz in this new telefantasya. Angelu is cast as Lourdes, Bobby is tapped to portray Dionisio, while Joko plays Antonio. Regine Velasquez is expected to play Sandawa (as revealed by Asia's Songbird through her Instagram account). Tom Rodriguez, the boyfriend of Carla Abellana, will also have a special participation in this telefantasya. Lovi mentioned that Ariel Rivera will also be part of this new TV show. Regine and Ariel were not present during the announcement. 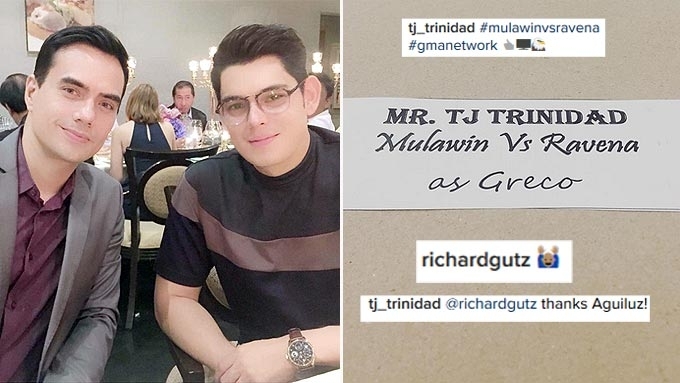 It was also not mentioned if Aguiluz (originally played by Richard Gutierrez) will have an appearance in the new Kapuso telefantasya. However, it may be recalled that his character died towards the end of the movie sequel. Is Heart worried about comparison with former Angel project? Who will join Regine Velasquez in Mulawin 2017 reboot?